Bergen, a city on the west coast of Norway, is on a list of the world's ten most underrated cities, compiled by CNN. CNN said that Bergen is one of several places around the world that are normally not on the average tourist's radar, but should be, citing it as an ideal destination for nature lovers. 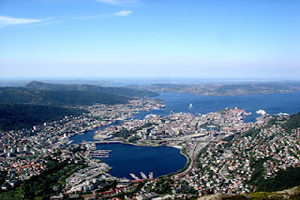 It described Bergen as the gateway to the Norwegian fjords. It also highlights the city's downtown area, its small-town charm and laid-back atmosphere, as well as attractions like the funicular up to Fløyen Mountain and the old Hanseatic harbour quarter of "Bryggen" - a UNESCO heritage site.